"What is your favorite book that you've written?" Sometimes I get asked how much money I make (it's fun to explain the royalty system of payment, where authors get 10 percent of the list price of a book - kids are amazed at how little money the author makes from the whole process). Sometimes I get asked how old I am, which I don't mind answering. Often I get asked where I get my ideas or what inspired me to write, questions that irritate me a tiny bit as I've just finished spending forty minutes explaining in considerable detail where I get my ideas and what inspired me to write. One kindergartner once raised his hand to ask me a question. "Now, is this really a QUESTION?" the teacher asked him? "A question, and not a STORY?" He nodded. "A question, meaning something you really want to know the answer to?" He nodded again. And then he asked his question, which was indeed a question, and indeed was something he wanted to know the answer to: "Can you tie my shoe for me?" "What do you do when you and your editor disagree?" "What do you do when you get stuck in the middle of a book?" "What do you do when you get to the end of the book and don't know how to end it?" "What do you do when you get writers' block?" "What do you do if you don't like the pictures made by your illustrator? Thanks for the great questions, Morikami students. It was lovely to meet you today! Greetings from West Palm Beach, Florida, where I'm spending a delightful four days at an event called April Is for Authors. Twenty-three authors are here, many of us nominees this year for the Florida Sunshine State Young Readers Award, as well as a number of local Florida authors. The event itself took place yesterday at Palm Beach Gardens High School. Each author gave at least one talk and took part on at least two panels, as well as signing heaps of books in the media center. Attendees included children and their parents, teachers, librarians, aspiring writers, anybody who has an interest in children's books and the people who write them. In addition, some of us are doing author visits to Palm Beach County schools. I spent Friday at Heritage Elementary; Monday I'll be at Morikami Park; today I'm just catching my breath at the lovely Embassy Suites Hotel, with its pair of swans swimming about in little pond in the the four-story atrium. The book of mine that is on the Sunshine State Young Readers Award list is How Oliver Olson Changed the World. As I told the children on Friday when I visited Heritage, I got the idea for the book when I visited an elementary school in Colorado. Prowling the hallways for book ideas (as I do assiduously these days, now that my own children, at ages 20 and 23, are no longer providing me story fodder, or at least no longer providing me fodder for children's chapter books), I came upon a display of student work: their ideas for how they would change the world. And so the book was born. We can donate toys, money, shoes, clothes, to poor children. My world changing idea is to only have police and the army to have weapons. Because they use them to kill people and it's not fair, people have to lose their lives for no reason. My life-changing idea is to supply real homes for the homeless. Stop putting chemicals in food. Get a robot to do your homework. My world changing idea is to make paper out of something else to save the trees. My world changing idea is stop throwing thrash into the ocean or the animals will die. My world changing idea is nobody should bully people. My world changing idea is helping collecting money to help buy things we need for the Earth. My idea is No Killing Whales! My world changing idea is everyone should get a chance to do something they want to do even if their parents won't let you. I think people should use their turn signals when they're supposed to because they could get in a car accident. I think kids should not have work to do on summer, spring, and winter break. Excellent ideas, Heritage Elementary! Grownups of the world, are you listening? On our way home from New Harmony, Cheryl and I stopped to pay tribute to young Abe Lincoln at the memorial to his boyhood home maintained as a National Historic Site. 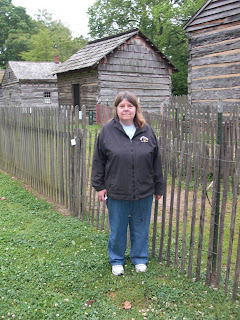 The Lincolns moved from Kentucky to Indiana when Abe was seven. 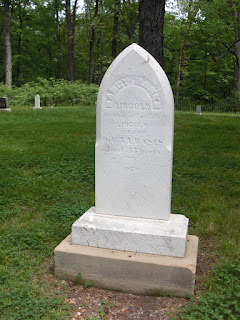 It was here in Indiana that his mother, Nancy Hanks Lincoln, died, here that his father brought his new stepmother home as a bride, here that he learned to read and write by the light of the fire on the kitchen hearth, here that he also buried his beloved older sister. 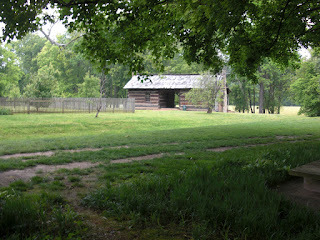 Visitors can wander along a peaceful path to a working farm on the land where the Lincoln cabin stood. Cows and sheep sleep peacefully under old trees. 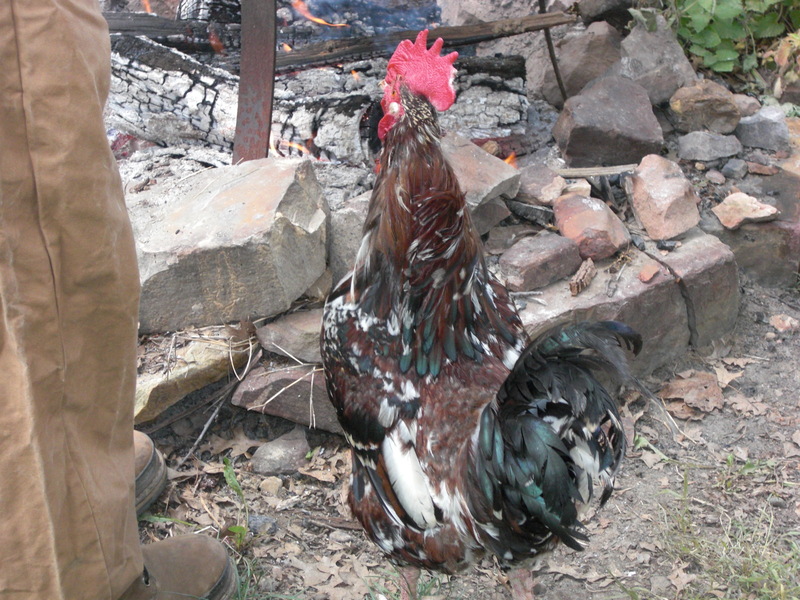 Roosters scratch contentedly in the dirt. You can also see Nancy Hanks's grave, marked with a newer, more impressive stone than the one the Lincolns would have placed there to honor her. If he went to town." There is nothing more fun in the world than a weekend spent with a sister. Or at least, a weekend spent with MY sister! Despite United's unexplained cancellation of Cheryl's original flight, due to arrive at the Indianapolis airport at 8:30 a.m. on Saturday morning, we crammed a huge amount of wonderfulness into the time remaining, once she arrived instead close to 2:00 p.m. We jumped into my trusty little car and began driving west to Terre Haute, then south to New Harmony. 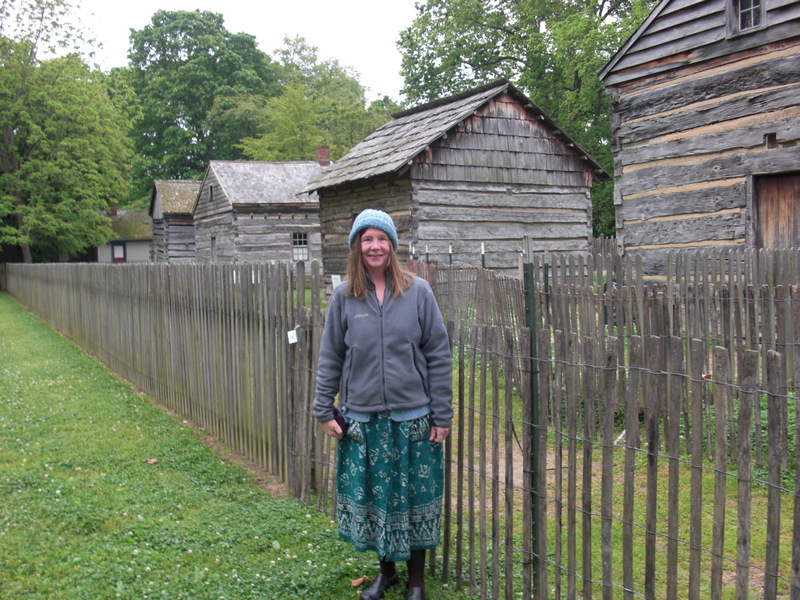 New Harmony is the historic site of not one but two utopian communities: first the German Pietist sect of Millennialists led by George Rapp, who cleared farmland from the forests on the banks of the Wabash River as they awaited the Second Coming of Christ in 1815. When Christ did not come as promptly as expected, they then sold their colony of Harmony to socialist reformer Robert Owen of Wales, who created New Harmony in 1825, organized around principles of equality, cooperation, and education for all. That community, too, failed to prosper. I have always had a fascination with utopian experiments from the time I first heard of Thomas More's famous formulation of Utopia back when I was in high school. 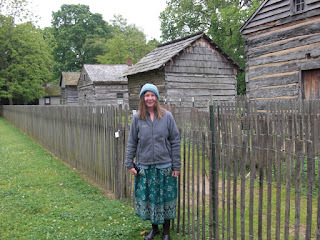 When I had to compile a major bibliography on any topic of my choice back when I was in library school at the University of Maryland, I chose the topic of American utopian communities. When I taught Philosophy through Literature two years ago at CU, I structured the course around the concept of utopia. And when Cheryl and I were children together, we spent endless hours inventing imaginary societies in imaginary countries, with names like Bladen, Soccer, Maloone, and Moo. These weren't particularly utopian in their design - we focused more on every detail of the boarding school attended by their princes and princesses - but this did demonstrate some impulse toward utopian aspiration, I'd say. 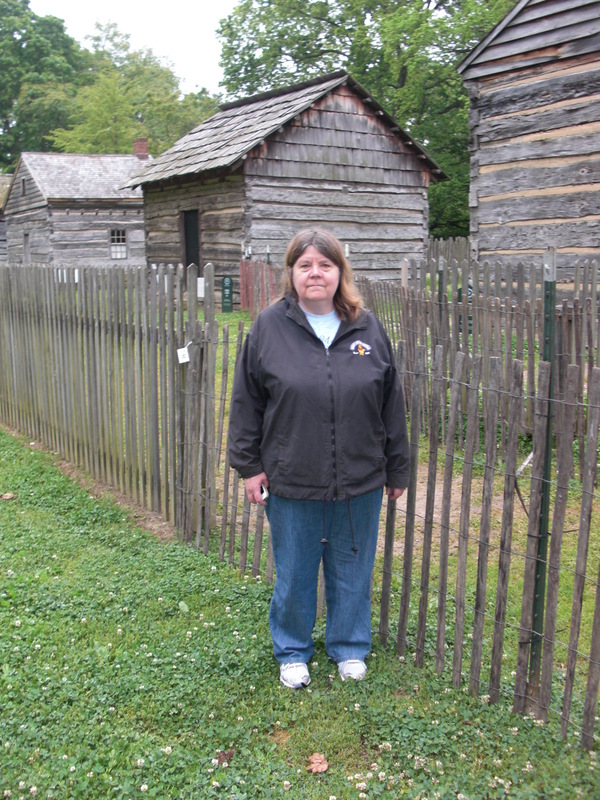 So it was bliss to walk the streets of New Harmony with Cheryl, on an early Sabbath morning. Today is the day my sister is arriving from New Jersey to spend the weekend with me; she has a business meeting at Eli Lilly in Indianapolis Monday-Wednesday, which means she can come a bit early and play with me. 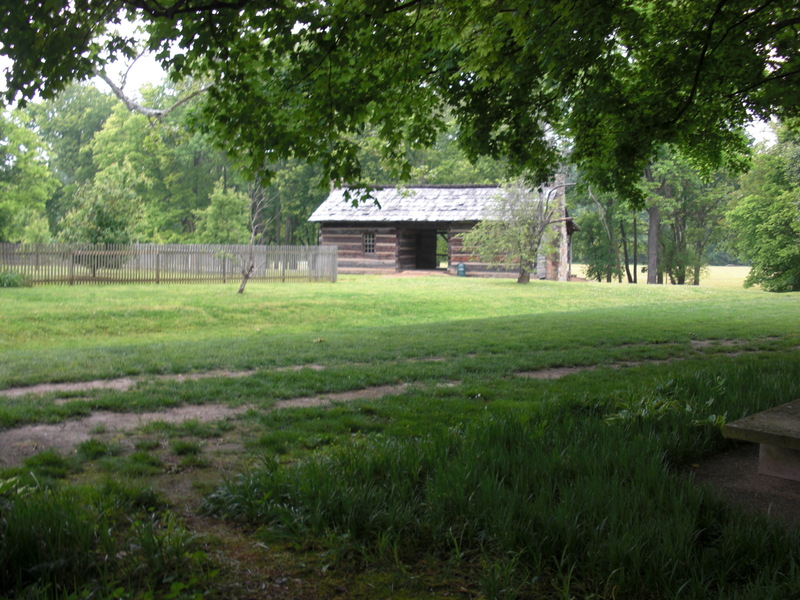 We have plans to play tourist and drive down to southern Indiana, where we'll spend the night near the site of the historic utopian communities at New Harmony and also see Lincoln's boyhood home. We Hoosiers feel quite defensive that everyone knows that Lincoln was born in a log cabin in Kentucky and practiced law in Springfield, Illinois ("Land of Lincoln"), but fewer people know that he spent his boyhood years right here in Indiana. In fact, I didn't know that myself until I spent hours poring over the Indiana guidebooks I bought at the airport bookstore a few months ago. Now I do. And soon I'll be there in person with Cheryl. But not as soon as we had planned, for I woke up this morning to find that Cheryl's United Airlines flight was cancelled. WAH!!! Instead of arriving in Indy at 8:30 this morning, now she won't arrive until 1. We would have already been in New Harmony by then, wandering around utopia. Disappointed as I am, I'm trying to reframe the situation and see this morning as a sort of unexpected gift. I've been given four and a half hours in Greencastle that I didn't expect to have. What to do with them? Catch up on email, of course, and write this blog. Breakfast at the Blue Door would seem to be in order, as I've neglected my friends there shamefully. Then I will go to the Putnam County Fairgrounds for the huge Fiber Event being held there, featuring workshops on weaving, spinning, linen from flax to finished product, and more. I haven't knit a stitch since my last session with the CU Philosophy Department knitting group The Knitted Brow many months ago. But I do have my knitting bag with me here in Indiana. Maybe I'll buy some wonderful new yarn today and get inspired to dig out my needles. Perhaps I can also walk this morning with my friend Nicki and her wonderful little dog, Henry. Then I'll hurry to the airport to pick up Cheryl and the real fun of the weekend will begin. But I might as well have at least some fun in this unexpected gift of a morning. Yesterday evening I had two back-to-back episodes of Greencastle happiness. First I went to the Putnam County Public Library (two blocks from my house) for a Celebration of Authors. The authors to be celebrated were first- and second-grade writers from Ridpath and Deer Meadow Elementary School, and me. The children's room was thronged with children who arrived clutching their stories, beaming parents and grandparents in tow. I talked to the assembled audience for about ten minutes about my own childhood love of reading and writing and how it led me to grow up to be a published author. Then the children divided into two groups by grade level to share their stories. I stayed with the second grade group and heard some impressive work - frankly, quite a bit better than my own writing at their age. Stories shared, we reconvened as a large group and I read the funniest bit from Fractions = Trouble!, where Wilson's friend Josh is conducting his science fair experiment centered on the question: "At what temperature does a pickle explode?" Then I dashed off to the final meeting of the Wendell Berry reading group - one of four faculty-staff-student reading groups sponsored this spring by the Prindle Institute (I'm in all four, of course!). We have been reading Berry's poetry, short stories, and essays, all exploring America's vanishing agrarian experience. One of the group's members is an actual farmer, farming in Berry's old-fashioned way that honors the land, so we had our closing meeting on his farm, just south of Cloverdale. As I arrived from the drive in the golden evening light, the others were just getting settled outdoors, in a circle formed of planks of wood set upon hay bales, near several three-hundred-year-old trees, as contented cows wandered about and a friendly dog tried to join in our conversation. Our English professor/poet member had brought two daughters; they were busy playing (or doing homework? or both?) in the barn. We sat together until dark, talking about land as a gift and the need for an environmental ethic that moves away from a focus on preserving nature from any human interaction to one that will allow humans to live and work harmoniously with the earth. My only regret from the evening was that I didn't play in the barn myself. But I can return. Jerry's farm isn't going anywhere. It's been farmed for generations. I can return another day. The Undergraduate Ethics Symposium here at DePauw finished up yesterday in a blaze of glory and an unabashed love fest among speakers, organizers, and participants. Some thirty student scholars/artists came to the Prindle Institute on Thursday afternoon to present analytic essays and creative works on a wide range of ethical issues and themes. The blind review process of almost a hundred submissions yielded a group of participants drawn from around the country: Harvard, Princeton, University of Central Arkansas, Haverford College, Bard College, University of Minnesota, Claremont McKenna, and of course, our own DePauw. Great was our excitement as we waited for the van to arrive from the airport bringing those who had come by air. After almost a year of planning, they were here! I was one of four symposium speakers. The others were journalist/memoirist Patricia Raybon, playwright Steven Dietz, and philosopher Matt Tedesco. I gave a philosophical talk on what we owe to our families and why; Matt gave a philosophical talk on moral dilemmas parents face as they make choices regarding the welfare of their children; Patricia spoke about the need for honesty, courage, and craft in sharing stories about our lives with others; Steven talked about the ways in which theater fosters ethical engagement as the "here and now" art form, following the performance of a scene from his play Lonely Planet. In my seminar session, students presented papers on topics including: reparations for slavery, openness and altruism in sperm donation, the role of faith-based organizations in refugee resettlement, religiously neutral child rearing, right-to-life campaigns targeted to African American women, human/nonhuman interactions, and justice in global health care. This was teaching at its most rewarding: to spend all day with extremely smart, motivated, prepared, and passionate students talking intently about what they love. And then, at two o'clock yesterday, the van came, and they departed. In our closing session, one student marveled that all this effort and expense had been lavished on an event celebrating undergraduate ethical inquiry. It really is quite amazing. And quite wonderful. And now we can begin preparing for the Undergraduate Ethics Symposium 2013! Today begins the fifth annual Undergraduate Ethics Symposium (UES) sponsored by the Prindle Institute for Ethics at DePauw University. Each year undergraduates from around the country submit works exploring some ethical issue - either analytic papers or creative pieces (this year we had over ninety submissions). After a rigorous review process, some thirty are accepted. Those students are then brought to campus, at the Prindle's expense, for an intense weekend of ethical conversation. The students share their work with each other in small seminars led by visiting faculty who serve as discussion leaders and also give a talk to the assembled attendees. It's a heady, exhilarating weekend for all involved. This is my fourth time attending the UES. I came first as one of the visiting faculty members: as soon as I walked in the door of the Prindle Institute, I fell in love, and I think it's fair to say that they fell in love with me, too. I was invited back the following year in the same role. Then I was invited to join the Prindle for a full year as a visiting professor, and so last year I attended the UES simply as a guest, to build excitement for my year-long stay. And now this year I'm the keynote speaker for the conference, as well as a seminar leader yet again. I'm excited to see the students begin to arrive this afternoon, but this year I'm also mildly terrified as well. It feels different to be the keynote speaker. And our wonderfully enthusiastic director of the Prindle Institute, Bob Steele, made the mistake of saying during a recent Prindle staff meeting that he was sure my talk would be the "stemwinder" to kick off the weekend's festivities. None of us had ever heard that term before. Apparently, it means a terrific rousing speech - according to dictionary.com, it means "a. something remarkable of its kind; b. a rousing speech, especially a stirring political address; or c: a stirring orator." Ever since he said that, the thought of my stemwinder has weighed heavily upon me. I can't sleep, wondering if my stemwinder will be appropriately stemwindery. I was planning on recycling a previous talk, as the theme of the symposium this year is "Ethics and Relationships: Friends, Family, and Community," and I have a talk that I thought would be perfect for the occasion: "The Ties That Bind: What Do We Owe to Our Families - and Why?" Oh, but is it a stemwinder? So now it's the day of the symposium. My talk is at 7:30 tonight. I have a few more hours to add some stemwindery touches, if I can think of some. I have a few. But do I have enough? I'm a decent speaker. But am I a stirring orator? At least, by bedtime tonight, it will all be behind me, either way, and I can rest on my stemwinder laurels, if laurels there be. This is DePauw University's 175th anniversary year, and one of our most distinguished alumni, children's book author Richard Peck, was on campus today to attend a poetry reading given by Prof. Joe Heithaus, who currently holds the Richard Peck chair in creative writing and who has just published an exquisite collection called Poison Sonnets. I was lucky enough to hear Richard Peck's guest lecture in Prof. Martha Rainbolt's children's literature class (this is the class I'm going to have the once-in-a-lifetime opportunity to teach this coming fall) and then to be part of the small group who joined him for lunch. For readers of this blog who are not children's literature people, Richard Peck is the Newbery Award-winning author of A Year Down Yonder, as well as many other critically acclaimed and best-selling works; he's also a legendary speaker. As he spoke today, I wrote down almost every sentence as fast as I could. As a writer, "You have to be all your characters. None of them should ever be you." "A story is a biography of the person the reader would like to be." "Nobody but a reader ever became a writer." All of his novels are stories of journeys: "things you could not learn by staying home." "There is no grade inflation in novels. Characters get only what they deserve." "You always learn the most from the experiences you would have avoided if you could." He writes on an electric typewriter, not on a computer, because "I never lost a young reader to an electric typewriter." On how he does research: "Every book begins in the library in the hope that it will end up there." If you do historical research, don't read history books, but read periodicals of the time, written "by people who don't know what will happen next." "A novel is always about someone who cannot go back so must go forward." His question is never "How long does it have to be?" but "How short can I make it?" I love this kind of pithy wisdom! The truest thing on this list is "You always learn the most from the experiences you would have avoided if you could." The falsest thing he said I didn't even put on this list, that the greatest novel of the second half of the twentieth century is Robert Cormier's The Chocolate War (which I hate!). The most intriguing thing he said (for me): "A novel is always about someone who cannot go back, so must go forward." I don't know if that is true, but I think it is a helpful way to think about a book as one works on it: have I placed my character in this kind of a situation? would it be helpful if I did? Richard Peck is also an extremely generous man. I'm little (as an author), and he's big, but he treated me like a peer. He spent most of our lunch conversation wanting to hear from the students at the table about their time at DePauw - their lives, their stories. Now I have to ponder more on his pronouncements. Have some of my characters been too much "me"? Would all of my pages be improved by cutting twenty words out of each one? (I keep remembering more things I didn't even have time to write down!) Is writing "sitting in an empty room trying to make a blank page speak"? Last fall I had a drink one evening with a new DePauw friend. I told her that I had just had a perfect day, which I had. Since then, whenever I see her, she asks me if I have had any more perfect days, in a tone that is part affectionately teasing, and part wistful. Usually, I have. It seems so easy to have perfect days here. All the ingredients for them are present. Right now I have had four perfect days in a row. Thursday was perfect because it began with breakfast at the Prindle with Nicki and Linda. The morning was cloudy, so I turned on the gas fireplace in the Great Hall and read for class while lying on a comfy couch. Class was lively, thanks to an enthusiastic student discussion leader. After office hours I headed out to the Prindle for the rededication of a large public sculpture called "Reach," which had been relocated from the main campus out to the Nature Park, the first of a series of sculptures to be located along a proposed Sculpture Walk leading from the Prindle Institute back to campus. The rededication ceremony featured a speech about the artwork by a DePauw art professor, a ceremonial poem for the occasion by wonderful DePauw poet Prof. Joe Heithaus, a performance of a John Cage composition by a dynamic percussion ensemble, and then - as if this weren't a perfect enough day - a gathering by the fire circle up above the Prindle where we toasted marshmallows to make s'mores. Wouldn't you call that a perfect day? Friday: another Prindle breakfast with Linda and Nicki; long happy hours working on the edited manuscript for my forthcoming novel No Exceptions; lunch with Linda and Nicki at Chief's just off the courthouse square followed by a long walk with Nicki and her little dog, Henry; a productive afternoon back at my office; and then seeing The Hunger Games at the one little Greencastle cinema just across the street from my house. Wouldn't you call that a perfect day, too? Saturday: breakfast at the Blue Door; long walk with Nicki and Henry through some of Greencastle's loveliest neighborhoods with every tree bedecked with spring flowers; an afternoon at the Prindle getting a huge amount of work done in the peace and quiet there, finishing my toil on my manuscript AND finishing the review of twenty submissions for CU's Rocky Mountain Ethics Congress coming up this summer; dinner with Keith and Meryl and Meryl's dear friend Debbie, visiting from Oxford. Sunday: Easter! - plus tea and New York Times with Keith - plus another long walk with Nicki and Henry - plus an evening curled up in bed reading A. J. Jacobs's wise, insightful, and hilarious memoir, The Year of Living Biblically, in which he tries to follow the Bible literally in every regard, from refusing to wear mixed fibers, to stoning adulterers, to loving his neighbor as himself. Four perfect days in a row. This might be a record. But I learned a long time ago that all I need for a perfect day is my four pillars of happiness: writing, reading, walking, friends, in any combination. If I can have those four plus the Blue Door Cafe, or plus Easter Sunday, or plus s'mores - what more could I ask for, really? This is my first Easter in Greencastle. Last Sunday I had Palm Sunday back at my beloved church in Boulder, St. Paul's United Methodist Church, for the procession of palms which unaccountably brought me to tears at the sight of the congregation's children eagerly thrusting palms at those of us in each pew, as we sang, not the traditional "Hosanna, Loud Hosanna," but "Lift High the Cross." But then I missed our huge church egg hunt on the Saturday before Easter, attended by church families, neighborhood families, and families invited through the Emergency Family Assistance Association. And I missed the youth sunrise service. And the first glimpse of the sanctuary transformed by lilies as well as a profusion of spring flowers. Instead, I walked up and down Seminary Street in Greencastle this morning as I talked on the phone to Christopher, who was getting ready to attend the Easter service on his base in Gulfport, Mississippi, shining his shoes to go with his dress uniform. Then I arrived at Gobin United Methodist Church, the church situated on one corner of the DePauw campus. Eager children handed me a white paper lily on a green pipecleaner stem; I tucked it into the bodice of my dress. The service began with "Christ the Lord Is Risen Today," as all Easter services ought to begin. The spectacular DePauw choir outdid itself, including a wonderful quartet made up of DePauw voice students singing an additional piece of their own. Children in the congregation decorated an Easter tree with symbols of the Resurrection. The service closed with a stunning performance of Charles-Marie Widor's famous organ Toccata, which I associate with all the years I attended Easter services at the National Cathedral in Washington, DC - glorious, swelling soaring music. And then I had Easter dinner with friends from church who kindly included me in their holiday gathering. So Easter would have been lovely in Boulder, but it was lovely here, too. As my readers know, I have come to love the small town of Greencastle, Indiana, with its mere ten thousand inhabitants. But today I discovered an even smaller town to fall in love with: Fillmore, Indiana, a few miles away, population 533. I was invited to Fillmore Elementary by a wonderful new arts organization called Castle Arts, founded by Beth Benedix. The mission of Castle Arts is to bring rich, creatively stimulating arts programming into public schools suffering from budget cuts that are decimating their arts offerings. In this pilot year, some eighteen or twenty artists, many of them DePauw University faculty, have been going to tiny Fillmore Elementary (one class per grade level) to engage the kids in every kind of art imaginable: poetry, dance, classical music, songwriting, painting, sculpture, and more. Today I spoke to seven, yes, seven classes, getting the kids to engage in an interactive activity around the writing principle "show, don't tell" and then to write their own stories showing a character's emotion or personality by placing him or her in a scene and letting a natural reaction unfold. Oh, and part of our charge was to integrate the science curriculum as well, so the students were writing about characters out on a field trip to gather fossils or to study the night sky through a telescope. Much exuberant energy emerged. I have to admit I'm exhausted now. But it was really a wonderful day. For lunch the organizers and I hurried off to Fillmore's one restaurant, a charming little eatery called Bert & Betty's. I had half of an open-faced tuna fish salad sandwich on home-made sourdough bread as well as my first-ever slice of an Indiana delicacy I had never heard of before: sugar cream pie, a pie shell spread with layers of creamed butter and sugar, then filled with vanilla cream, and baked. Apparently it is supposed to be a dessert you can rustle up even when the apple bin is empty and your cupboards are otherwise bare. I didn't end up adoring sugar cream pie, but I'm certainly glad I sampled it. I love sampling all things Indiana. I especially love sampling them on a rainy, green-green-green Indiana day when I've given seven talks to lively children who seemed to be as happy to have me there as I was to spend the day in their company. One of the highlights of my spring break was spending two days doing school visits at three different schools in the North Kansas City School District. The kids were lively and well prepared, and I even came away from Bell Prairie Elementary with a possible idea for a new chapter book series: watch this spot! But the most fun was staying for two nights with my friend April Armstrong, who in addition to being an extremely motivating school librarian is also an amazing musician (piano, fiddle, hammered dulcimer) and an even more amazing composer of her haunting compositions for solo piano. I stayed with her a year ago on a visit to her school, and instantly we recognized each other as Anne-of-Green-Gables-style "kindred spirits." Each morning we would get up early. April would go the piano and compose. I would lie on the little bed in her darling guest room and write. I have never felt more creative energy in any environment in my whole entire life. April just has her first CD out: The Pink Rose. I am obsessed with it. I listen to it over and over again on my computer in my office and then take it with me as I drive anywhere so I can listen to it over and over again in my car. Go visit her website at http://www.pinkrosemusic.com/thepinkrose.html and buy copies of her CD for everybody you know. I want her to sell a million copies! I leave in an hour to get the bus to the airport to fly back to Indiana. My week of spring break was crammed full of even more fun than I had expected. I surprised myself by absolutely adoring the Yves St. Laurent retrospective I attended with Rowan at the Denver Art Museum. I had never thought of myself as a "fashion" person; after all, I buy ALL of my clothes from the Fairview Marching Band yard sale and from the Greencastle Goodwill. But, oh, those suits, dresses, pants, tuxedos, and gowns were delicious! And then, to continue our sojourn in Paris, Rowan and I watched Woody Allen's Midnight in Paris last night. The plot was definitely predictable, but in such a satisfying way, and I loved spending time with Hemingway, F. Scott Fitzgerald, Picasso, and Gertrude Stein. But even better than spending time in France this week was spending time in Colorado: those mountains! that sunshine! dinner at the teahouse! strolling down Pearl Street! Much as I love my stay in Indiana, right now I'm feeling a bit weary from juggling my two lives. The thing I have loved most about my appointment at DePauw is that I can be my whole true self: philosopher AND children's book scholar AND children's book writer, teaching Rousseau and Rawls in the philosophy department AND children's literature in the English department AND children's book writing during winter term, as well as organizing a major symposium on Ethics and Children's Literature scheduled for this coming September. But the price I am paying for being my whole integrated professional self these days is to be a fragmented divided geographical self. It is hard living in two places, having to tear myself away from one to go back back to the other. I don't think I'll be back in Colorado again now until the beginning of July. July! I miss my church and writing group already desperately, even though I worshiped at St. Paul's in the morning yesterday for Palm Sunday and met with my writing group in the afternoon to share a new series idea and plan our summer retreat. Colorado, I love you so much! How can I leave you? Indiana, I love you so much! I can't wait to come home to you later today. I've chopped my heart in half, and it beats in two different time zones now.